We are a small kennel situated in Cootamundra, which is in rural New South Wales, Australia. We are roughly midway between Melbourne and Sydney. It is an ideal area for dog exhibitors as we are fortunate to have a very wide choice of shows within two hours of our home. Our experience in showing is not limited to dogs. Both Brian and Lesley grew up with horses, and have both shown and competed . Brian is a harness judge, and Lesley has judged led and ridden classes- her first love is dressage. Lesley is now a licenced Hound and Gundog Group judge. She is also an accredited Junior Handler Judge. Special thanks must go to our wonderful children James, Lachlan and Claire. Without their help in so many ways we would not have been able to achieve what we have. Our dogs are not only show dogs, they are a part of our family. We are totally committed to these merry little dogs and their amazing good natures. Type and movement are very important to us, but it must be combined with that special temperament. We love a well constructed Beagle, and believe that a good dog should not be disregarded because it may happen to fall outside of the recommended height range. We also love a classically beautiful head, with a tight rimmed, expressive, dark eye. 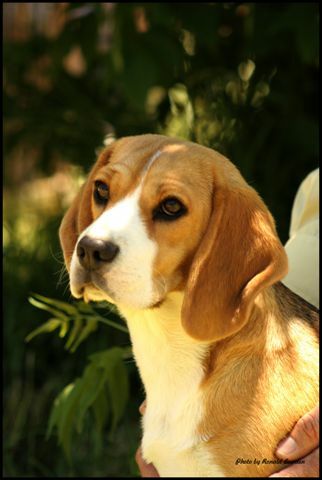 We are in the process of DNA profiling all of our dogs, our way of guaranteeing that the Beagles' pedigrees truly represent the breeding of our dogs. Quite simply, our guarantee that our dogs are as registered. Visitors are always welcome, just ring first! We are always more than happy to talk about our favourite breed, so email or ring and we will do what we can to assist you. We are always available to answer you questions relating to your Beagle, we are there for you for the lifetime of your dog and often beyond.